Mass spectrometry is a sensitive technique used in the field of proteomics that allows for simultaneous detection and characterization of several proteins in a sample. It is also a powerful methodology to elucidate protein–protein interactions in a sequence-dependent and unbiased manner. 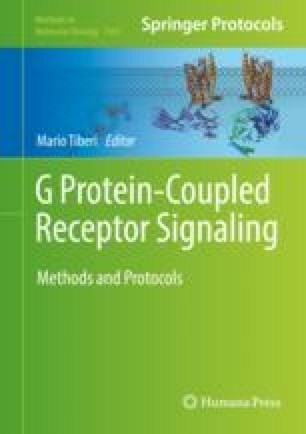 G protein-coupled receptors (GPCRs) seldom function in isolation and characterization of proteins present in the receptor complex (or its interactome) is critical for understanding the vast spectrum of functions these receptors perform in a context-dependent manner. Here, we describe a mass spectrometry-based method to sequence and characterize proteins present in heteromeric complexes formed by corticotropin-releasing factor (CRF) receptors that belong to class B GPCRs. CRF receptor heteromeric complexes were identified in HEK293 cells co-transfected with tagged CRF receptors 1 and 2. CRF receptors were immunoprecipitated using antibodies against the tags from transfected HEK293 cells and proteins in their interactome were identified using liquid chromatography mass spectrometry method (LC-MS/MS). Both CRF receptors were identified in this interactome. A few of the proteins identified in the CRF receptor interactome using MS were confirmed to be true interactions using traditional co-immunoprecipitation and Western blotting methods. This work was supported by NIH grants DK080787 to A. Bhargava and GM8P41GM103481 to A. Burlingame. B.H. was supported by T32 AT003997.